These amazing mirrors are a new launch from Another Brand, a London-based company run by designer Theo Williams (previously of Alessi, Lexon, Prada, John Lewis Home and Habitat). They’re made from solid oak and oak veneer - the tabletop vanity mirrors are solid oak, and the wall hung mirrors have a solid oak body with oak veneer on the front. 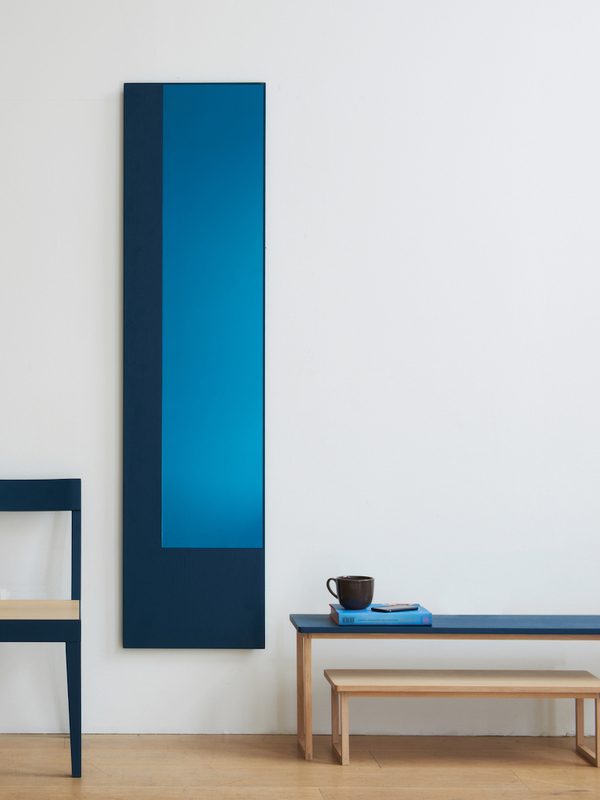 You can choose between either a natural or petrol blue finish, with a choice of four different mirror finishes. The natural oak and amber is my stand-out favourite combination. Coloured glass mirrors seem to be the new hot thing right now – I first saw the idea on Brose~Fogale’s valet stand and vanity mirror several years ago but now they really seem to be everywhere. The first question that jumps to my mind: is coloured glass really the most practical material to use in a product whose sole purpose is to accurately reflect the image of your face back at you? I can’t imagine it’s that easy to blend concealer with your skin tinged amber or blue. It's difficult to tell for sure since the demonstration uses an item that's completely black, but in the image below the reflection looks pretty clear with little to no colour distortion. I’d have to put my face up close to one to say for sure, but until then I’m willing to give them the benefit of the doubt. There are several different sizes to choose from and each mirror can be hung either horizontally or vertically, which gives you quite a few different configurations to choose from. The long and thin one, for example, would be perfect hung horizontally in a hallway for checking your hair on your way out the door. Alternatively, flip it round the other way and lean it against your bedroom wall as a full-length mirror. If you’re really fussy they even have a bespoke service, so you can specify the exact dimensions and have one made especially for you. Prices vary based on colour and size, but as a guide the small oak/amber ones start from £180 and the larger ones from £420. If you fancy checking out Orlo ‘in the flesh’ and you live in London, you can head to their stand at Clerkenwell Design Week from 24th – 26th May 2016. They’ll be in Design Fields on stand SF1d.